FAQ / Create public To Do lists and Share with Everyone! What is To Do Alive? How do I create a To Do Alive list? How do I copy a To Do item to my own To Do Alive list? How do I make a comment on a To Do item? How do I mark a To Do item as completed? Can I post YouTube and Vimeo videos on my To Do items? How do I change my Profile Picture or Information? How can I share my To Do Alive list with my friends? How do I invite my friends to join To Do Alive? What is the To Do Alive gadget? Can I monetize my To Do Alive lists? How do I sign-up for Adsense? 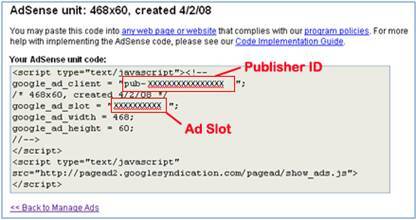 What is Adsense “Publisher ID" and “Ad Slot”? Will To Do Alive support other Advertisement Network? How do I submit a complaint about copyright, impersonation and trademark? What is the copyright guideline for using videos, images and photos? How can I contact the ToDoAlive.com team? 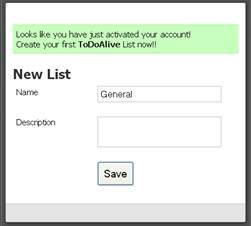 When you first sign-up with To Do Alive, after your email confirmation, you will be prompted to create and save a “list”. You can choose to change the name “General” to your preferred name or you can select “SAVE” to proceed. At the top menu, click on “Profile” to access the profile page. Or on the left menu by clicking on the “New List” button. Click on “New List” to create a new list. When you are viewing a To Do item, you can click on the “plus” (+) symbol to copy and add the To Do task to your own to do list. Please see following image. To make a comment on a To Do item, select the “arrow” ( ) symbol to call out the “comment box” to add your comments. Similarly, to mark a To Do item as completed, select the “tick” ( ) symbol to call out the “completion box”. Fill in the details and save your information. Yes you can. 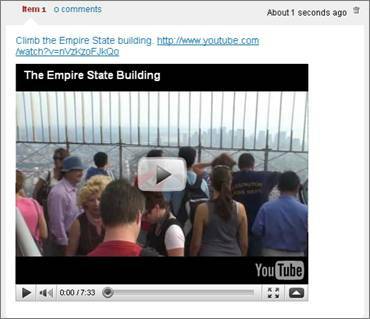 Just copy the URL of the videos and paste them into your To Do item. After you saved, the video will appear each time you click on the video link. 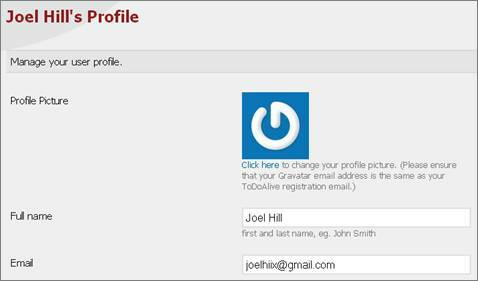 To update your Profile Picture, all you need to do is to register at Gravatar.com. The benefit of signing up with Gravatar is that you will not need to upload photos or picture each time you sign-up at a site that support it. Gravatar (an abbreviation for Globally Recognized AVATAR) is a service for providing globally-unique avatars which was created by Tom Preston-Werner. If you already have a Facebook account, you do not need to sign up again. Just use Facebook Connect to sign up on ToDoAlive. Click on the Facebook Login button and Facebook will ask you to give your permission to login to ToDoAlive. You can share your To Do Alive lists with your friend through a number of ways. Use the To Do Alive’s invitation feature (http://todoalive.com/account/invite) to invite your friends to join you on To Do Alive. By using the AddThis feature. If you have accounts with Twitter, Facebook, MySpace, Google, Live, etc., you can easily share your To Do items with your friends or the world. Just select your favourite sharing feature and login to share. By using the To Do Alive Gadget. You can invite your friends to join ToDoAlive.com by sending them an invitation. 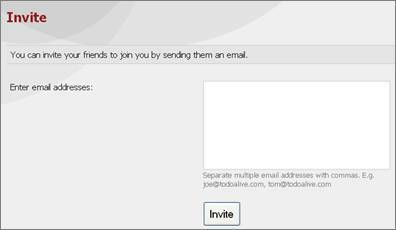 The To Do Alive’s invitation feature (http://todoalive.com/account/invite) allows you to key in multiple emails to invite multiple friends to join you on To Do Alive. 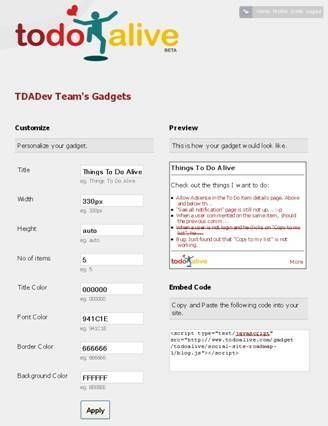 The To Do Alive Gadget is for you to share your To Do Items with your friends and followers via your blog or website. 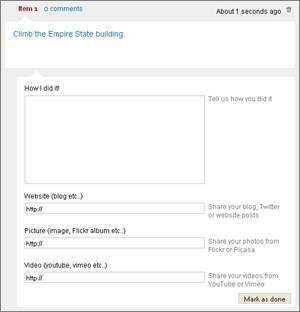 The gadget will display your To Do items, and when clicked, will take your followers to your personal To Do Alive site. Yes, you can. All you need to do is to have an Adsense account. Access your ToDoAlive Adsense under your ToDoAlive Profile. Create the advertisement according to Google Adsense’s requirements. Be sure to create your ad with the following size: 468x60, as ToDoAlive only supports this size at the moment. All you need to do now is to copy and paste the above in red, into your ToDoAlive’s Profile’s Adsense section. Google AdSense is a free program that enables website publishers of all sizes to display relevant Google ads and earn. (https://www.google.com/adsense ). Go to https://www.google.com/adsense/g-app-single-1 to sign-up with Google Adsense. In future we will support more Advertisement Network including text link ads. If you have a legitimate complain, please email to todoalive . You can contact us at todoalive . Please send any bug reports to todoalive . Your bug reports is much appreciated and will be treated as gold! Thanks!